- Line Management and Knots - Fly Tying - materials provided - On River Safety and Etiquette Plus a separate half day of on-stream fishing with a mentor! Adults: $150 Youth 12 to 18: $100 5-Rivers Students: $125 Bring your own bag lunch or add $15 for a Mediterranean wrap from the Purple Onion. Lunch is only 30 minutes thus you will need to stay on site. Our Mission Conserve, protect and restore coldwater fisheries and their watersheds in the Western North Carolina region. Come join us, May 20th for our Monthly Meeting! James Keith Whalen is the Forest Fish Biologist for the Francis Marion and Sumter National Forests in South Carolina. He has been the Forest Fish biologist here in South Carolina since 2016. He has been a Fish Biologist for the Forest Service for 20 years. Before coming to South Carolina he was the Forest Fish Biologist on the Ozark/St. Francis National Forests in Arkansas for 12 years. Before that he was a Biologist with the US Forest Service Southern Research Station-Coldwater Fisheries Unit out of Blacksburg, Virginia for 5 years. He has a BS degree in Forestry – Fisheries Science from Virginia Tech and MS degree from James Madison University in Biology. He grew up in the mountains of southwestern Virginia fishing in the tributaries of the New River and the headwaters of the Holston River. Brandon Barber, currently owner and operator of RiverBlade Knife & Fly Shop on HWY 9 in Spartanburg SC. I have been fly fishing for 35 years, started chasing the bluegill and bass around my uncles pond with my dad as a kid. Continued to fly fish for warm water species through high school and started trout fishing once I got into college. I started doing guided trips for trout in 2001, travelling from Aiken County as I woroked as a Pathology PA at the time. I moved to Spartanburg in 2005 and guided for the South Holston River Fly Shop (Champion Outfitters at the time) in 2006. I opened RiverBlade Knife & Fly Shop in 2010 and have been doing that ever since. I specialize in teaching newcomers and beginners how to fly fish and my guided trips are catered to that. I have caught numerous species of fish on the fly over the years including, but not limited to, trout, largemouth bass, smallmouth bass, spotted bass, striped bass and hybrids, bluegill and other panfish, carp, longnose gar, crappie and catfish. One Big Day. One Great Event! Join us for fun, delicious food, great friends and to give back to Elk Country by attending the Upstate SC RMEF's Night Out @ Saskatoon on Thursday, March 21st, 2019 at 6:00 PM! We are very pleased and excited about our new venue and event format at the Saskatoon Lodge & Event Center. This casual event will have fast paced fun with Guns, Guns & more Guns!!! We will have games & raffles plus a Super Silent Auction (new this year). Tickets are limited so purchase your ticket today. Also, your admission ticket automatically enters you in the door prize drawings with a chance to win lots of great items plus a .243 scoped rifle! This is the do-not-miss social event of the year with a chance to win top notch firearms, premium hunts and lots of items and jewelry for the ladies too! What prize will you win at this year’s event? Debbie was born in upstate SC, and grew up in a fishing family . She spent much of her formative years chasing stripers and largemouth in the large reservoirs of SC. While attending college in the mountains of SC, she became a competitive mountain bike racer and spent her free time exploring the hills of western NC. While ripping around the local trails had taken her all over the Appalachians, the explorer in her longed to see parts of the mountains you can't get to by bike. Picking up a fly rod was a natural progression, and Debbie was hooked. She has fished for trout all over the country, and learned to row on Montana’s Yellowstone River. Debbie has spent time on most of the popular trout streams in Western NC, and some that most people have never heard of. She prefers small ,difficult to reach wild trout streams.....which are plentiful in the Blue Ridge Mountains. Debbie is a full time guide at Davidson River Outfitters in Pisgah Forest NC, and lives in Travelers Rest SC. OK....The MBTU 2019 spring camp out has been reserved for March 15th Friday to Sunday March 17th at the Davidson River Campground. If you want to attend, you must make your own tent site reservations. I suggest that you do that as soon as possible as campsites will book up fast for spring camping and fishing. The MBTU main camp site is #045. We will hangout at the main site and have our famous Saturday evening dinner. Helmuth will make his world famous award winning peach and blueberry cobbler in his Dutch Oven. If you want to just fish and have dinner with some of the best outstanding MBTU guys/gals...you can come up on Saturday. More information will be sent out as we get closer to the date. If you are going to attend, please let me know. We will be cleaning up the South Saluda River at the "Rock Vanes" and the Adopt-A-Mile clean up of the Highway 11/276 right-of-way two mile stretch adjacent to the Rock Vane area and then fish the Rock Vane area of the stream. We will begin at 9:00 am and it should only take 1 to 1.5 hours to complete the clean up. Bring gloves and come join us for this worthwhile effort! Our next meeting will be on February 18th. 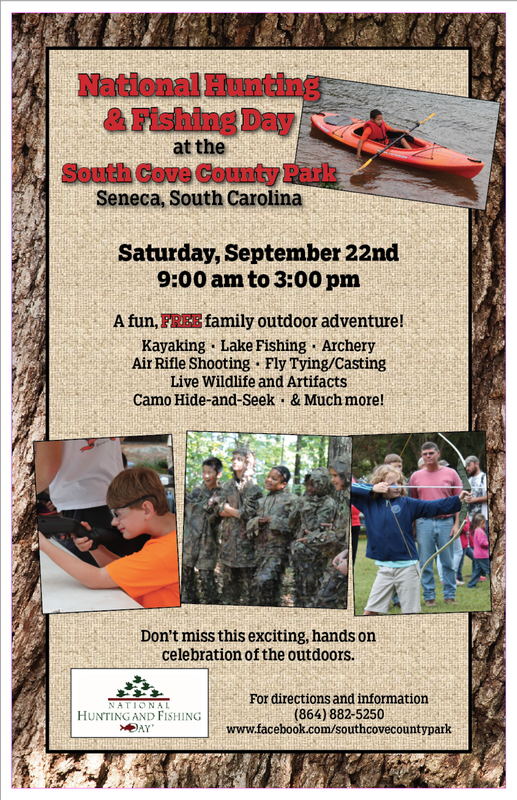 Our guest speaker will be Jacob McCanless from Southern Appalachian Outdoors. Meetings begin at 6:30 pm. January Monthly Meeting at 6:30 pm on Monday the 21st. We will be hosting our first ever Fly Fishing and Outdoor gear Swap/Buy/Sell/Trade event. Come join us at our January Monthly Meeting at 6:30 pm on Monday the 21st. We will be hosting our first ever Fly Fishing and Outdoor gear Swap/Buy/Sell/Trade event. Bring gear you have to buy/sell/trade/swap, including fishing gear, camping gear, outdoor clothes, boots, shoes, waders, Kayak, Kayak accessories. No firearms or ammo, please. This should be a big event and a great opportunity to free up some space in your garage and snag a great deal on some used gear. Join us November 19th at 6:30 pm for our regular monthly meeting. November’s speaker will be Dave Armstrong, a long time chapter member, and currently the Legal Advisor to the National Board of Trustees and its Executive Committee. We will be cleaning up the South Saluda River at the "Rock Vanes" and the Adopt-A-Mile clean up of the Highway 11/276 right-of-way two mile stretch adjacent to the Rock Vane area and then fish the Rock Vane area of the stream. We will begin at 9:00 am and it should only take 1 to 1.5 hours to complete the clean up. Afterwards, we will fish the rock vane area or go to the Eastatoe River, if the rock vane area is poor fishing. Orange safety vests and plastic bags will be provided (we also have about 10 pick-up "grabbers" for you to use). You should bring and wear gloves. Come join us for this beneficial effort. We always have loads of fun for a very worthwhile cause. SCDNR (Dan Rankin) needs help stocking trout in the Eastatoe Creek at Dug Mountain parking area at 9:00am on Oct. 31 (Happy Halloween). The site is #42 in the SCDNR Trout Guide. It is 1.3 miles north off Hwy 11 on Roy F. Jones Road on the right after crossing Eastatoe Creek. The Roy F. Jones Road intersection is 4.9 miles traveling west from the intersection of Hwy 178 and Hwy 11. Contact Gary Davis if you can help or need further information at 636-346-0413 gdavis6032@.sbcglobal.net. Join us on Saturday October 27th for the 6th annual “Tie One On for Casting Carolinas Team Challenge” presented by Mission Health. The Tournament will be held on Raven Fork in Cherokee. Teams of two anglers in Professional, Amateur and Alumnae Divisions compete in this fun tournament for cash and great prizes!! Just $250 per team. To sign up or sponsor go to www.castingcarolinas.com “Tournament page.” To volunteer or for more information contact Josh Garris: josh@castingcarolinas.com. There will be live music, BBQ and a silent auction on the day of the event. All proceeds go directly toward funding Casting Carolinas retreats and programs. MBTU OUTING ALERT - DAVIDSON RIVER CAMP OUT - OCTOBER 18TH TO OCTOBER 21ST. Ok...this is your chance to experience a MBTU camp out and fishing trip on the Davidson River in North Carolina. MBTU has reserved camping site #045 by the river. This site will be the main site where we will hang out, have one main feast together...probably Saturday dinner...and tell fishing stories about the one that got away. Helmuth will make his world famous Dutch Oven Peach Cobbler! All MBTU members and guests are invited. If you are interested in attending, please RSVP. More details will be forthcoming as we get closer to the date. You must reserve your own campsite near the main MBTU #045 site. I suggest that you select your campsite early because they will fill up fast during this time of year. Come join us October 15th. Karl Ekberg of the Chattooga River Fly Shop will be our speaker. SCDNR (Dan Rankin) needs help conducting a fish sampling on the Whitewater River. Waders will be needed. It will be conducted on Monday, Oct. 15, 2018 at 8:30am 1/8 mile east from the bridge across Whitewater River (35°01'07.60" N/82°59'42.99" W ). Take Whitewater Falls Hwy (Hwy 130) north from Hwy 11 10 miles to the entrance to the Duke Power Bad Creek facility. Turn right into the facility and follow the road down the hill and turn left at the first left into the adm/maintenance site and the parking lot for the Foothills Trail. Turn right onto the gravel road (gate should be open) and follow to meeting area after crossing the bridge over the Whitewater River. Contact Gary Davis if you can help or need further information at 636-346-0413 gdavis6032@.sbcglobal.net. Get your tickets here for the 2018 Fly Fishing Film Tour coming to Greenville, courtesy of Mountain Bridge TU! Come meet Mountain Bridge TU's finest at Cabela's from 9-12 on September 29nd. They will be sharing info on joining TU, fishing trips, and the 3rd annual Fly Fishing Film Festival in Greenville SC on October 5th. Tix on sell now! National Hunting and Fishing Day! fun for all. Lots of booths including MBTU and PHW. Come meet Mountain Bridge TU's finest at Cabela's from 9-12 on September 22nd. They will be sharing info on joining TU, fishing trips, and the 3rd annual Fly Fishing Film Festival in Greenville SC on October 5th. Tix on sell now! Casting for Hope's Ovarian and Gynecological Cancer Patient/Survivor and Caregiver Retreat is September 14-16 at the Casting for Hope Retreat Center in Bakersville (Mitchell County) NC. Our guests are treated to a weekend "away from it all" in order to de-stress, enjoy a quiet setting, share cancer-journey stories, learn new things, and be pampered by people who care. This retreat is FREE...no cost to the patients and caregivers who attend. "I continue to reflect on the amazing Casting for Hope weekend. Everything was so well planned and just perfect in spite of the rain. The speakers, food, gifts and fly-fishing experience are so much appreciated. I am grateful for the experience." We will be grateful, too, if you would mention the retreat to any one in your network who may be interested in attending. For more information, email me at kathy@castingforhope.org or call me at 828-712-2716. Mark White has camped and fished Cataloochee and loves it! Kevin Kubach is a fisheries biologist with the SCDNR statewide research program. He will be discussing the Environmental DNA (eDNA) as a tool for fish conservation and management, with applications in coldwater. Come Join us! Come join us at The Local Cue for a Meet and Greet with SweetWater Brewing Company. We will have info on memberships, fishing outings, and of course this year's Fly Fishing Film Tour! Fly Tying Night. Bring your vise and equipment and learn along with other members to tie their favorite flies. Mountain Bridge will hold our Annual Picnic on Friday, June 8th at the picnic shelter 001 at Paris Mountain State Park. Mountain Bridge will provide BBQ, buns, coleslaw, chips, baked beans, ice and condiments. Please bring a covered dish, deserts are welcome and your beverage of choice. There is a lake at the picnic shelter, so bring your gear if you would like. Come join us May 21st at our Monthly Meeting. Chuck Rouse will be our guest speaker! Chuck has been a member of Trout Unlimited for 10 to 11 years and was one of the original developers of the Project Healing Waters Fly Fishing program working with Jim Hopkins and Gordon Anderson. His education background is Mechanical Engineering (ME) University of Youngstown and BS with majors in Psychology, Math, Chemistry and Economics from University of Pittsburgh; Almost a professional student, after serving in the U.S. Army Security Agency from 1964 to 1970: with extensive foreign duty serving in Vietnam initially as a MAGV Advisor then onto MACV also based in the Philippines, Italy and Germany. He currently does business consulting and project management specializing in logistics and supply chain activities. His last employment was President of All Star manufacturing in Lakeland FL and COO of Penco Products Hatfield, PA. He came to Greenville in 1999 as Executive VP of Engineered Products. Prior to that he worked through various companies: FROG Navigation Systems, Managing Director of the Americas (North, South and Central); Litton Industries, Sales and Marketing Director of Industrial Automation; Apogee Robotics, VP Sales and Marketing: Interlake, Director National Accounts and Systems Sales Manager East Coast; Standard Products and Application Engineer, Mathews Div. of Rexnord. He is Past Commander of American Legion Post 3 Greenville and currently serves as Commander of the Color / Honor Guard, Chair of the Public Relations Committee and serves on the finance committee. He is married, 49 years, with two daughters and four granddaughters all outdoors people. Andy Brown joined the employment of Trout Unlimited on April 17, 2017 as its Stream Restoration Manager for the Southern Appalachians. Andy occupies the role formerly served by Damon Hearne. Andy is collaborating with TU chapters, federal and state natural resource agencies, private landowners and other partners to advance the cause of coldwater fisheries conservation in the mountains of southwest Virginia to north Georgia and upstate South Carolina, including all points in between. Andy has degrees in public administration, environmental policy and planning and cultural anthropology. For 14 years he served as the president and principal conservation planner for Equinox Environmental in Asheville NC, a for-profit consulting firm he founded in 1998 to facilitate conservation and sustainable development. Andy is also a stonemason and novice blacksmith. As for fishing, he’s always been more comfortable where he was born and raised on flat, blackwater rivers in northeast NC or in the sounds and surf of the Atlantic Ocean. But he is now eager to round out his experience by getting more comfortable with a fly rod on swift moving trout waters! Andy lives in Asheville, NC when he is not on his farm in Buladean (headwaters of Big Rock Creek; Mitchell County NC). He is married for 24 years and has two daughters aged 17 and 25 and a grandson aged 5. Ok...get out your camping equipment, camp stove, tent and bedroll from the garage attic and get ready to camp out and fly fish on the Davidson River this spring! We have a campsite reserved March 22nd to March 25th. Campsites will be a first-come-first-serve signup outing for a maximum 10 adults. MBTU Ladies...you are invited too! MBTU camp outings are really fun. Invision...sitting around a campfire telling your trout fishing stories! There are two approved times to stretch the truth...telling the weather forecast and fish stories...so plan to join other MBTU members to tell your story on March 22nd. The 10 spots will fill up fast so please let me know if you are interested. If you have any questions contact me. More details will be forthcoming as we get closer to the date.